Every day, people are seriously injured by products which are defective or are improperly designed. 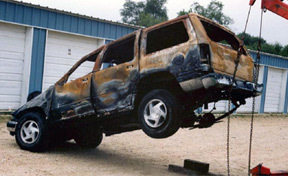 When automobiles have manufacturing or design defects, lives hang in the balance. Defective product lawyers hold companies responsible for their short-sightedness, obtaining for victims settlements and verdicts to fully compensate them for their injuries or loss. At Bellas & Wachowski Attorneys at Law, we believe strongly in our work. As we discuss in Lawsuits Have Saved Millions of Lives, defective product litigation has been successful in protecting the public from unscrupulous companies. When a company places profit over safety, you have to affect their bottom line to protect consumers. As we put it in another article, Big Business Needs Reins . Many auto defect cases start out as simple auto accident cases. Without contacting an experienced attorney, accident victims are unaware of the true reasons for their crash and injuries. Our attorneys know how to examine the scene of the crash, examine the car's Electronic Control Module ("Black Box") , and find out the true causes. Before you agree to anything given to you by an insurance company or other large company, contact Bellas & Wachowski Attorneys at Law for a free consultation with one of our attorneys. We do all such cases on contingency, charging no attorneys' fees until you are paid and protecting your finances with our Total Guard Approach.